Following events like the Deer Park chemical fire last week, I often field questions from the community about the procedures we have in Cypress-Fairbanks ISD to decide potential actions to take as a district. CFISD works closely with organizations such as the Harris County Office of Emergency Management and the Texas Commission on Environmental Quality as well as fellow superintendents from every school district in the county to make important decisions on opening or closing schools and procedures we may implement during the school day. 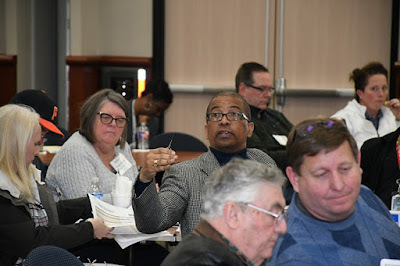 In the case of ongoing events such as the fire, Hurricane Harvey flooding and the ice days we had in 2018, I joined at least one conference call a day with various Harris County organizations and other school districts to hear the latest on the key factors impacting our schools – be it weather, water levels, road conditions or air quality. We take this obligation very seriously in CFISD. We want to keep our students, staff and parents sufficiently informed and our schools safe and secure. I am grateful for the preparation and collaboration of our county agencies and school districts during major events to try to make the best decision for hundreds of thousands of students and families across the county. You may have read Monday’s story about the Senate Finance Committee passing Senate Bill 3, a piece of legislation that would provide annual $5,000 pay raises for all full-time classroom teachers. Even though the bill doesn’t meet everyone’s expectations, I am extremely appreciative that our senators and representatives recognize the great contributions that teachers have made to the lives of our students. SB3 is a positive sign that our state leaders are serious about addressing the needs in our public school system. As the 86th Texas Legislative Session moves forward, I am confident that our lawmakers will also find a way to reward the essential contributions that our campus leaders, librarians, counselors, diagnosticians and other professionals provide to the success of our school system. We are grateful to have thousands of operations support personnel and instructional aides in CFISD. These hard-working employees make sure our campuses are operational and our students succeed in the classroom. I applaud our legislators from both sides of the aisle for uniting on an issue that impacts more than 90 percent of the school-aged children in Texas who attend public schools. Government works best when our leaders work together! When you get a chance, thank our state leaders for taking this first step toward helping Texas public schools be the best that they can be. You can find out who represents you by entering your address on the Texas Legislature website. Last night, Feb. 11, during their regularly scheduled monthly meeting, our Board of Trustees unanimously voted to call a bond election for May 4, 2019. Community members living within Cypress-Fairbanks ISD will vote on the $1,762,000,000 referendum this spring. · facilities renovations and additions. Community members collaborate during a January long-range planning committee meeting. More information on what is included in the referendum, as well as the detailed recommendation given to the Board, can be found on the LRPC webpage. I encourage you to review the information to help prepare you for an informed vote in May. The projected impact of the bond on our debt service tax rate (also called the Interest and Sinking tax rate), would amount to an incremental change of up to 3 cents over a seven-year period. A home valued at $200,000 would have a maximum annual I&S tax increase of $40.50 by the year 2025. Remember that this is only a projection. Prior to the 2014 bond election, we forecasted a maximum tax increase of 4.5 cents and it actually decreased by one penny. Please note that there would be no tax increase for those 65 years of age or older or who are disabled and who qualify for an over-65 homestead exemption, according to Texas Property Tax Code Section 11.26. 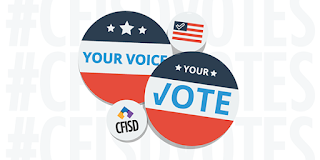 We will continue to post more information on the district website (www.cfisd.net) and our social media channels (search #CFISDBond) in the coming weeks to answer potential questions and supply voting information to our community members. We will also deliver a series of presentations at upcoming events to help inform the voting public. Thank you in advance for committing to making an informed vote in the 2019 bond election. 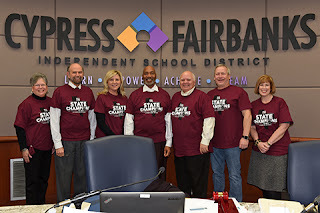 As we close the book on another calendar year, I am proud to look back on the many successes of 2018 and the way we demonstrated Opportunity for All throughout Cypress-Fairbanks ISD. 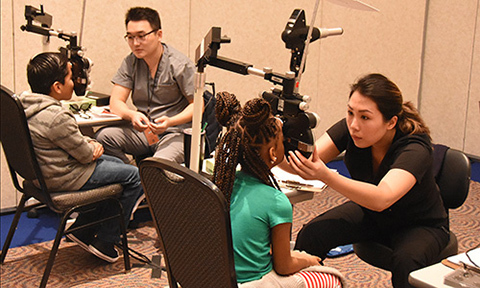 That #CFISDspirit was evident starting in January, when we partnered with the Houston Health Department to bring free eye exams and eyewear to thousands of students through the See to Succeed program. Our health services department is already expecting more than 1,000 students to utilize this life-changing program in January 2019! We celebrated many fine arts successes, like the 38 TMEA All-State musicians who performed in San Antonio in February. The Cy-Fair and Jersey Village high school marching bands both qualified for the state championship in November, finishing among the top 33 groups in Texas. Athletics achievements were all around us. 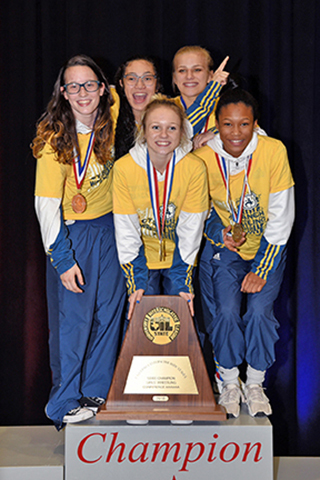 We celebrated the Cypress Ranch High School girls’ wrestling team as they won their first-ever UIL state championship last February. Cypress Woods High School basketball standout Cate Reese was named a McDonald’s All-American. We even cheered on an Olympian, as Cy-Fair High School alum Sam McGuffie competed in bobsled in South Korea. 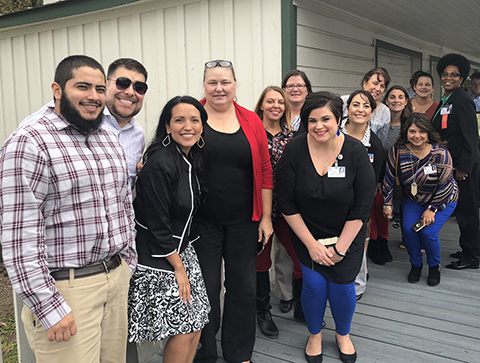 Our educators continued to set themselves apart in 2018. 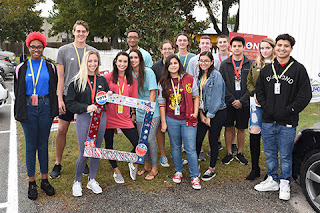 Cypress Falls High School New Arrival Center instructor Pamela Broussard was named an H-E-B Excellence in Education award finalist. Lamkin Elementary School visual arts specialist Jeanna Peña was recognized as Region 4 Teacher of the Year. 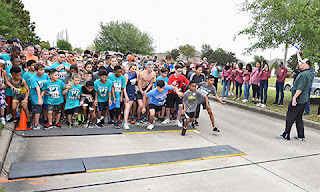 I was overwhelmed by the way the community came together for the fifth annual Superintendent’s Fun Run in March, raising a record $100,000 for the Cy-Fair Educational Foundation. Save the date for the sixth annual event on March 2, 2019 at the Berry Center! It was truly a year of outstanding highlights. There were 27 National Merit honorees. More than $700,000 was given to Livestock Show and Sale projects. Our voters had great turnouts at the polls. Our Camp Summit summer literacy program won a prestigious national award. We handed out a record number of diplomas to Class of 2018 graduates. CFISD was once again the largest district in the state to have all our campuses meet the state’s academic standards. But as you can see, we are defined by much more than our test scores. We are a district that gives students with the most challenges and the most potential the same first-class education. 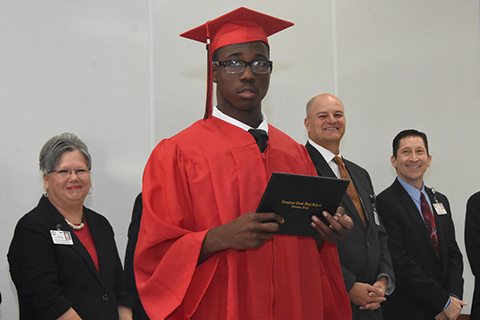 We are a place where every student can succeed no matter what their gifts or challenges may be. We provide opportunities to become a great athlete or artist, to be involved in robotics, to transition into an Ivy League school or the workforce. We had an incredible year, but we look forward to 2019 and the promise it brings for our entire community. On behalf of Cypress-Fairbanks ISD, I wish you a safe and restful holiday break. See you in January! As the Thanksgiving holiday approaches next week, I encourage you to take a moment to count your blessings. To lead by example, I have created a short list of things I am thankful for during this season of giving. I cherish my CFISD family and the way it comes together for every occasion. Recently, when challenged to get out and vote, staff and students alike organized major efforts to make their voices heard. I was so proud to see that when #CFISDvotes, it votes big! I am thankful for the courageous veterans who have defended our freedoms for 242 years. 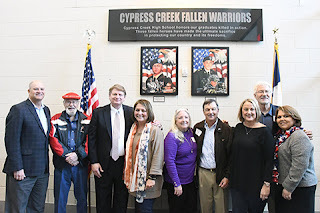 I was humbled to meet the families of Cypress Creek HS graduates SPC Scott Quentin Larson Jr. and Cpl. Scott A. McIntosh, who lost their lives in Operation Iraqi Freedom, during the unveiling of Cypress Creek’s Fallen Warriors memorial on Oct. 9. Heroes are all around us. 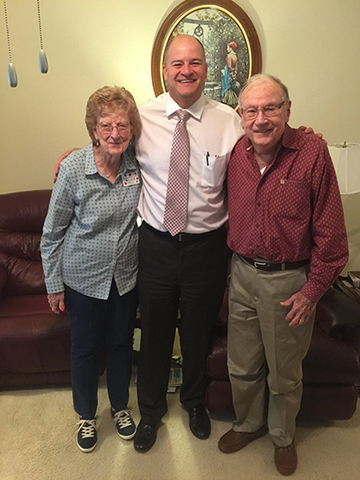 My friend Walter Grice, pictured below with his wife Mary, is a Purple Heart recipient from World War II. He served more than 70 years ago in his youth so I and others could be free today. I am thankful to work with a Board of Trustees who are aligned with the vision of Opportunity for All. These seven servant leaders truly cheer all students to succeed! Family is everything. I was raised by great parents who have been married for 65 years and continue to set an incredible example for me to this day. My wife, Cindy, is my rock and I am so grateful for her. 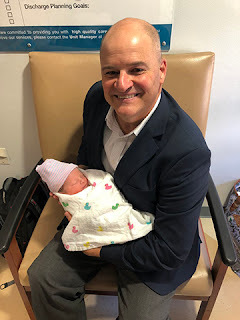 Blessings continue to multiply in the form of beautiful grandchildren. I am now up to five following the arrival of Homer Sutton on Oct. 3. I am blessed to be able to spend Thanksgiving with all of them. Too easily we forget how much we have to be thankful for. During this Thanksgiving break, briefly hit the pause button and reflect on those blessings. Enjoy the time off, and I will see you back on Nov. 26! The two-week early voting period for the Nov. 6 general election began today, Monday, Oct. 22 and will continue through Nov. 2. I encourage you to make your voice heard by casting your vote either at an early voting site or your election day polling location. Please take a few minutes to browse the voter-specific ballot and polling locations on Harris County Clerk Stan Stanart’s website by entering in your name and address. You can also access the early voting sites and hours on the site. Prairie View A&M University - Northwest (9449 Grant Road, Houston, 77070). Voting is a key component of the freedom and democracy we enjoy in the United States, but too few of registered voters participate in this important process. I encourage each of you to exercise your right to vote, either during the early voting period or on Election Day. It’s no secret that our community is passionate about fine arts, and our universal public education system reflects this value. I was proud to report during my annual State of the District address to the Cy-Fair Houston Chamber of Commerce that nearly 87,000 of our students participate in fine arts. 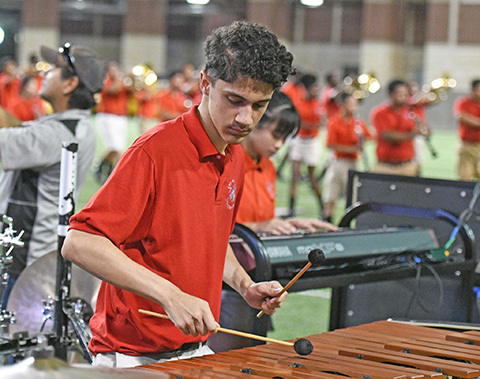 That number—representing nearly 75 percent of our enrollment—includes award-winning choir, orchestra, band, dance, theatre arts and visual arts participants from elementary through high school. Today, however, I wanted to specifically highlight the 2,675 students throughout our 12 high schools taking part in marching band. 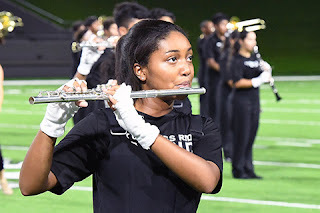 The Langham Creek HS marching band in action! The Cypress Ridge HS marching band performing at halftime! Many of these students began learning to play their instruments as early as the sixth grade. In the years since, they have honed their marching abilities to match their refined musical skills. 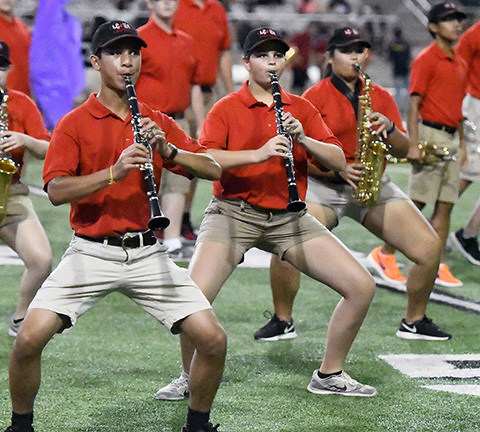 Marching band incorporates not only music, but dance, movement and theatrical and thematic materials to make an on-field ensemble that is beyond impressive. We know that fine arts like marching band help students perform better academically, but I have also observed the added benefits of teamwork, discipline, leadership and time management that are crucial to a young person’s total education. The Cypress Lakes HS percussion section making spectacular sounds! Bridgeland HS tuba players participating in their first-ever varsity football halftime! 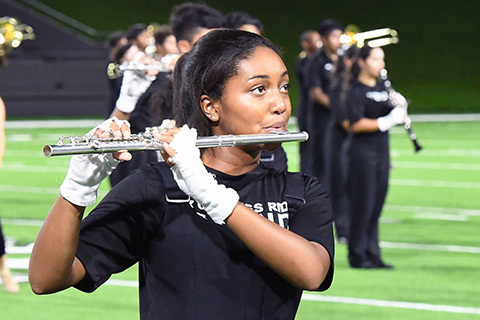 It’s the fall, which means it’s marching band season! 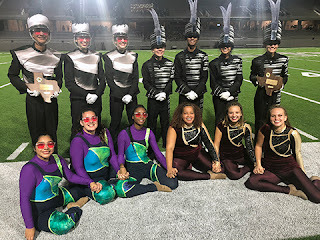 I have enjoyed seeing all the schools’ routines during halftime of our football games at Cy-Fair FCU and Pridgeon stadiums, and look forward to the upcoming competition season. As we are in an even-numbered year, Class 6A bands have the opportunity to advance to UIL regional, area and state competitions. 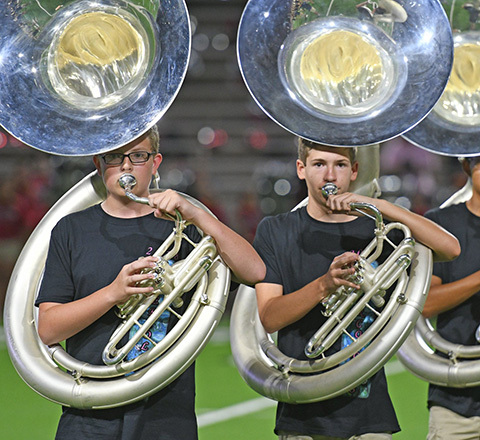 CFISD bands routinely qualify for state, where they march against the top ensembles in Texas. More detailed contest information will be posted on the CFISD website during the week leading up to each event. 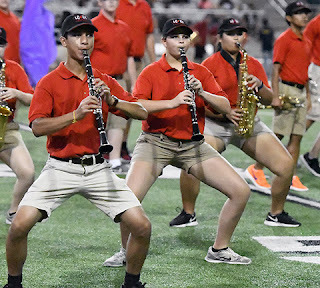 I invite you to come watch these talented students in action during the 2018 marching season and witness Opportunity for All in action. Our fine arts programs give us a lot to cheer about in CFISD! I plan on sharing more program-specific posts throughout the school year so you can join me in cheering on the outstanding accomplishments of these students. "We maximize every student's potential through rigorous and relevant learning experiences preparing students to be 21st Century global leaders." CFISD reserves the right to delete comments that use inappropriate language, are defamatory, or are otherwise unrelated to the CFISD posting. A Publication of the Communication Department, Cypress-Fairbanks ISD. Picture Window theme. Theme images by Jason Morrow. Powered by Blogger.